A lovely pair of Rhodium twist hoop earrings with a hinged post and elegantly set in 10 carat yellow. 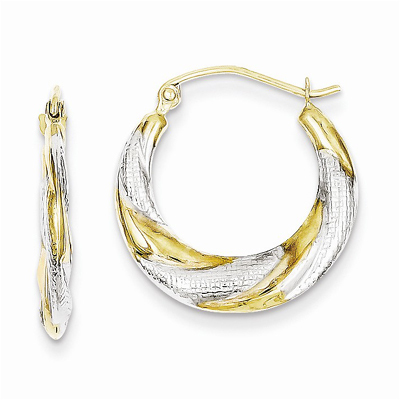 Wear these earrings with your hair up to show off the perfect textured accessory. Measurements of 20mm in length and 19mm in width, they are easy to wear. We guarantee our 10K & Rhodium Twist Hollow Hoop Earrings to be high quality, authentic jewelry, as described above.